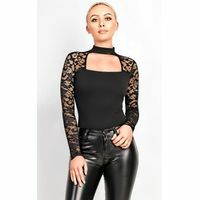 IKRUSH Womens Miya Off Shoulder Bodysuit. This bodysuit is unreal ladies! It is an on-trend off shoulder style. It is made from a Stretch fabric and has a simple popper fastening. Just add heels for a stunning party look!Polyester/elastaneUnderarm to hemline is approx.